Lung cancer is cancer that starts in the windpipe (trachea), the main airway (bronchus) or the lung tissue. Lung cancer is the third most common cancer in the UK with around 46,400 people diagnosed each year. There are 2 main types of lung cancer; non small cell lung cancer (NSCLC) and small cell lung cancer (SCLC). 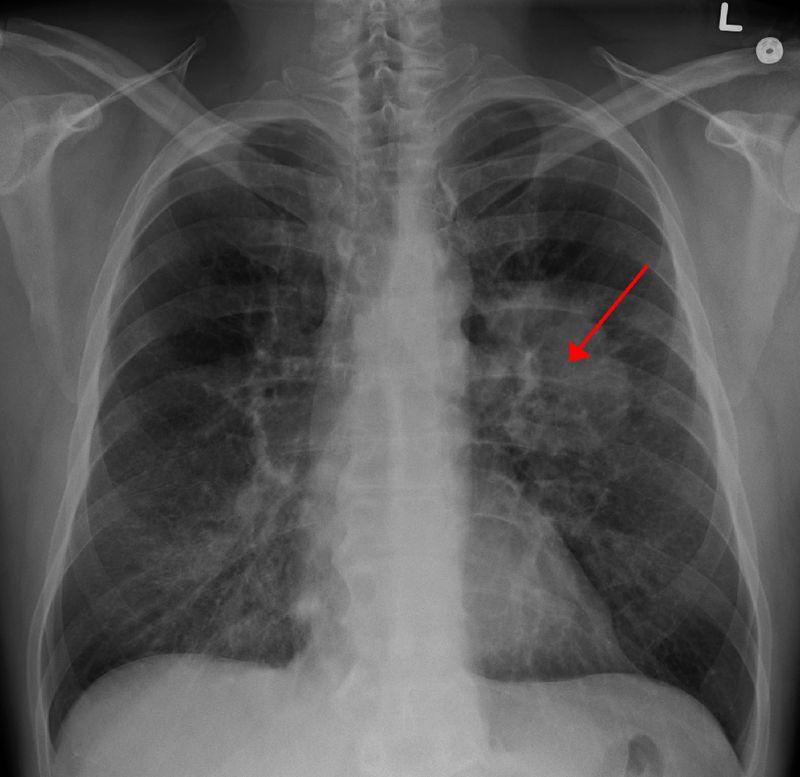 Other types of lung cancer include pancoast tumours (top part of the lung and only make up 5% of lung cancers). The type of lung cancer depends on the type of cell that the cancer started in. About 12% of lung cancers are small cell cancers. About 87% are NSCLC and there are three types of NSCLC; adenocarcinoma, squamous cell carcinoma (SCC) and large call carcinoma. There are also undifferentiated NSCLC as the cells look very undeveloped under the microscope so the doctor will not be able to tell which type of NSCLC the person has. Undeveloped cancer cells are called undifferentiated cancers. The main treatments for NSCLC and SCLC are chemotherapy, radiotherapy, surgery, chemoradiotherapy (chemotherapy with radiotherapy) and symptom control treatments. Patients will have one or more of these treatments depending on stage of the cancer and how well the treatment works. Survival is depended on many different factors including individual condition, type of cancer, treatment and fitness level. unfortunately, lung cancer survival has not improved much in the last 40 years because many people are diagnosed at a later stage. No UK-wide statistics are available for different stages of lung cancer or individual treatments. The following statistics are from one area of England for people diagnosed between 2002 and 2006. For one year survival, patients with stage 1 cancer, more than 80% will survive their cancer for a year or more, for stage 2 cancer more than 60% will survive their cancer for a year or more, for stage 3 40% will survive their cancer for a year or more and for stage 4 cancer less than 20% will survive their cancer for a year or more after diagnosis. For 5 year survival, patients with stage 1 35% will survive their cancer for 5 years or more, for patients with stage 2 more than 20% will survive their cancer for 5 years or more, for stage 3 around 6% will survive their cancer for 5 years or more and sadly for stage 4 cancer there are no statistics as many people do not live more than 2 years after diagnosis. Mesothelioma is a cancer that most commonly starts in the layers of tissue that cover each lung (the pleura). More rarely it starts in the layer of tissue in the abdomen that surrounds the digestive system organs (the peritoneum). It is quite a rare cancer in the UK, with around 2700 people diagnosed each year. Men are five times more likely to get mesothelioma than women. About 75% of mesotheliomas are in the chest and this is called pleural mesothelioma. About 25% of mesotheliomas are in the abdomen and this is called peritoneal mesothelioma. Mesothelioma is also grouped according to how the cells look under the microscope. There are three types; epithelioid (most common), sarcomatoid or fibrous and mixed type (biphasic type). It can then be further devided into other types; clear cell, small cell, acinar cell and tubopapillary cell. Unfortunately pleural mesothelioma can be very difficult to treat as it is often found when it is advanced. Nearly all treatment aims to control the mesothelioma for as long as possible and keep symptoms under control. Some people with early stage mesothelioma have surgey followed by chemotherapy or radiotherapy or a combination of both. People with more advanced mesothelioma might have chemotherapy to shrink it and reduce symptoms. Radiotherapy can also be used to shrink the cancer and control the symptoms. Some people with localised peritoneal mesothelioma can have surgery to try to remove all the tumour from the abdominal cavity. If they have advanced mesothelioma, surgery may be used to take away as much tumour as possible and this is called debulking. Chemotherapy may be used on its own for advanced peritoneal mesothelioma or before or after surgery. There are no UK wide statistics available for mesothelioma survival because mesothelioma is rare. The following statistics are for England and are for people diagnosed between 2010 and 2014. Almost 50% of men survive their mesothelioma for 1 year or more and around 50% of women survive their mesothelioma for 1 year or more after diagnosis. Around 5% of men survive their mesothelioma for 5 years or more and 10% of women survive their mesothelioma for 5 years or more after diagnosis. In the Cambridge Cancer Centre, we offer both treatment for today’s patients and research into improving treatment and prevention of lung cancer in the future. At Addenbrooke’s and Papworth we offer today’s patients a full diagnostic and treatment service which helps over 500 patients every year. The interests of the patient are always the top priority. We offer patients the best routine care. Whenever possible, we also offer patients the opportunity to take part in clinical research. The latest techniques are used both in routine practice and in research protocols to provide a very accurate diagnosis, including the exact type and extent of disease and the molecular characteristics of the disease. Specialised techniques include endobronchial ultrasound biopsy, MRI assessment of lung nodules and molecular characterisation within the Cancer Research UK Stratified Medicine Initiative. Together, these techniques allow the team to tailor treatment to the individual. Where possible, surgery is offered at Papworth to remove fully the cancer. Where this is not possible, the patient will be offered appropriate medical treatment at Addenbrooke’s which may include radiotherapy or drug treatment. Further details of services at Papworth Hospital and Addenbrooke's Hospital. Cambridge is the regional referral centre for lung cancer. Addenbrooke's Hospital has a substantial patient base with over 500 new referrals annually, research bronchoscopy clinics, and a highly performing clinical trials team including early phase clinical trials expertise. Papworth Hospital will soon relocate to the Cambridge Biomedical Campus to form the largest cardio-thoracic centre in Europe. Addenbrooke's Hospital carries out over 150 research bronchoscopies every year and is the second highest recruiter to LungSearch (a trial testing ways of detecting lung cancer at an early stage in people whose lungs are not working normally). Research is focused on developing minimally invasive strategies for identifying high-risk patients, including sampling upper airway mucosa, genomics of plasma and/or sputum DNA, novel imaging techniques, bronchoscopic studies, and detailed clinical and epidemiological surveys. The purpose of this trial is to study the combination of vandetanib and selumetinib, novel agents which target the growth factors EGFR/VEGF and MEK, respectively. Cancers are often driven by multiple molecular aberrations, so it is important to find out whether inhibition of multiple oncogenic pathways might lead to better clinical outcomes. The first part of this phase I trial will include patients with any solid tumour and the second part of the trial will include only patients with non small-cell lung cancer. The trial aims to find out if the two drugs can be given together safely, the maximum dose that can be given, potential side effects and what happens to the drugs inside the body.